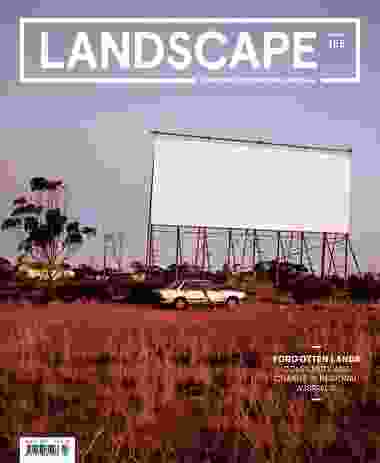 The August 2017 issue of Landscape Architecture Australia – Forgotten Lands: Complexity and Change in Regional Australia. Australia is a vast country of ancient landscapes, home to the longest living culture on earth. 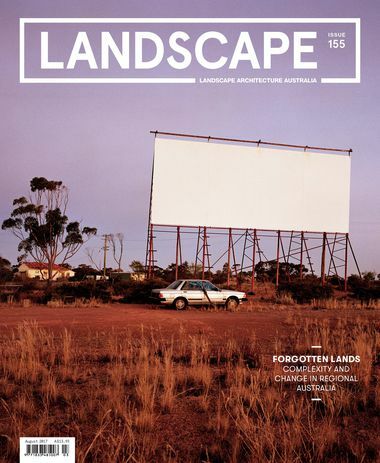 This issue of Landscape Architecture Australia goes bush to uncover a wealth of exciting projects and initiatives that creatively and thoughtfully respond to complex circumstances in regional Australia. Urbanization and climate change are two of the most pressing concerns that our built environment professions face today. Many agree that these forces will be more severely felt in regional areas than they will in urban areas, just as they will be more severely felt by people on lower incomes than by those on higher incomes. the city. Cities are where the overwhelming majority of us live (or the suburbs, more accurately) and they provide most of our jobs. They rightly deserve much of our attention. However, cities do not exist in a vacuum – urbanization processes equally affect rural areas. By placing all of our focus on cities we risk ignoring the issues beyond the sprawl and as we have recently seen in various world events, such as the United States election and Brexit, we ignore the rural at our peril. 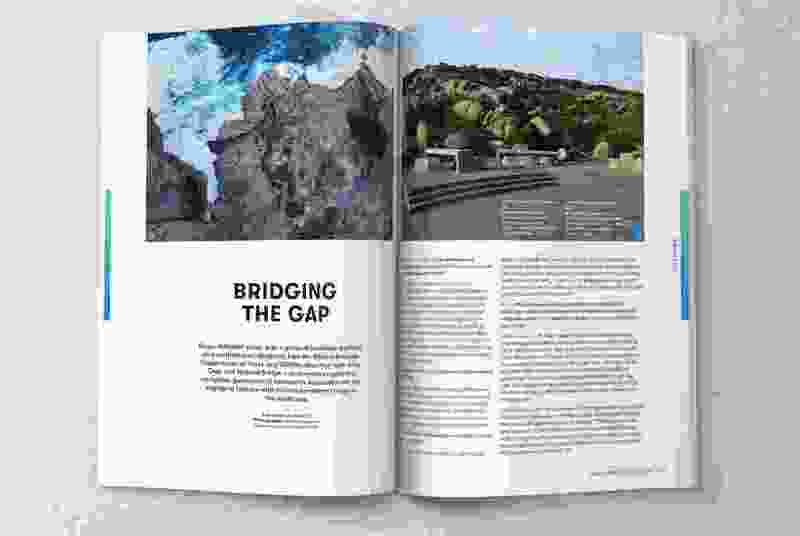 A recent report from the Climate Council has revealed that global warming is likely to worsen the systemic disadvantages suffered by rural and regional communities and further widen the gap between rural and urban areas.1 If there is a silver lining here, it’s that regional communities also have the most to gain from tackling climate change, by attracting the lion’s share of renewable energy investment and clean energy jobs. Unfortunately this is still a very partisan issue surrounded by uncertainty, so the fates of many communities hang in the balance. 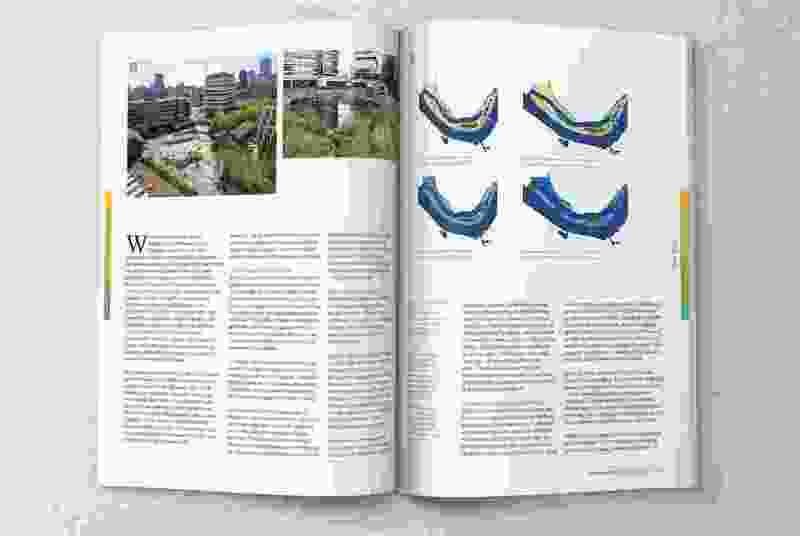 In this issue we touch on the topic of energy with landscape architect David Moir (p. 24). He discusses our national energy debate and how it affects regional communities and landscapes, focusing on windfarm development in New South Wales. 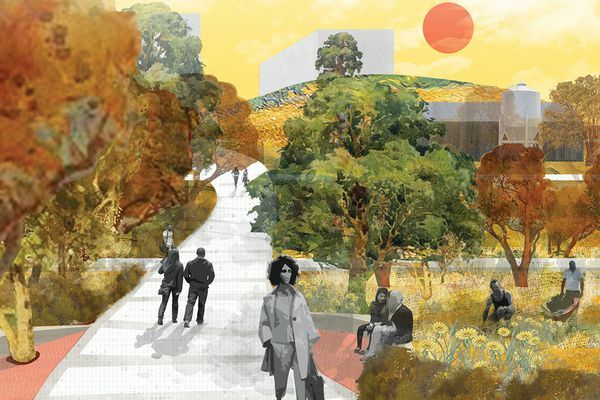 At our recent Landscape Australia conference in Sydney, speaker Thomas Woltz presented a slide that simply read “private land matters,” referring at once to the large amount of land in the United States that is privately held and how important it is for landscape professionals to apply their expertise in this space. Woltz’s firm, Nelson Byrd Woltz, has carved out a niche completing farm-scale projects for private landowners in the US, New Zealand and recently Tasmania, balancing ecological improvement with sustainable agriculture. Not far behind the US, Australia is the sixth largest country by landmass in the world, and an enormous 51 percent of the continent is used for dryland livestock grazing.2 How this land is managed has enormous consequences, not only for the environment but also for our economy. 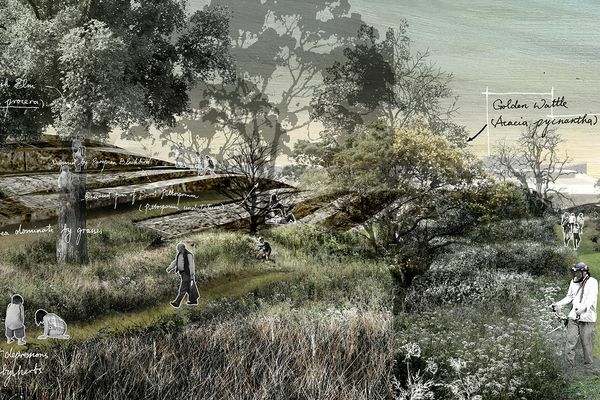 Landscape architects in Australia are not often engaged in designing management strategies for farming properties, but there are important stories to be told about rethinking agriculture. 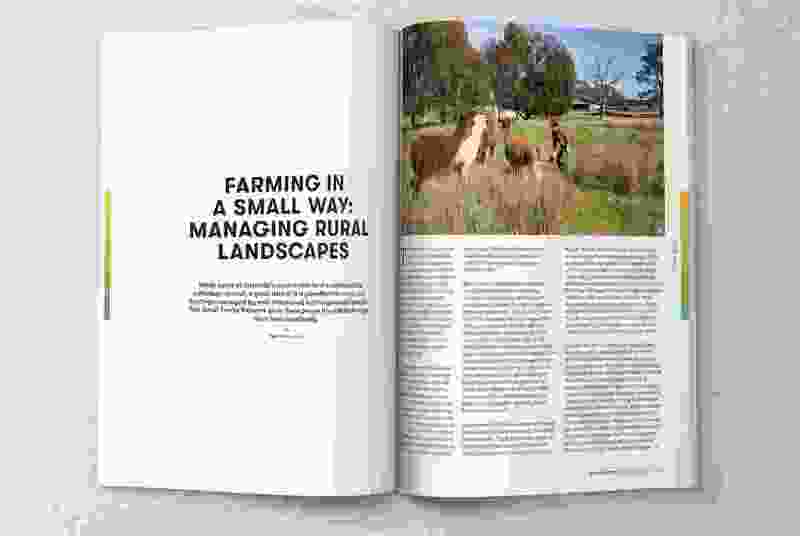 David Marsh, a grazier from southern New South Wales, has shifted from a mainstream industrial agricultural approach to a more nuanced ecological approach over four decades of farming his property. He shares his fascinating experience in this issue (p. 29). As Marsh notes, rethinking conventional wisdom about things such as stock numbers and fencing can lead to far more resilient landscapes and business models. to educate and share knowledge between landowners, many of whom move to hobby farms from urban areas with no experience managing rural landscapes. 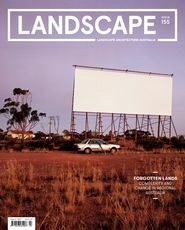 And in his essay “Fields of Decline” (p. 19), Karl Kullmann reflects on the challenges faced by shrinking communities and offers strategies to reinvigorate towns in Western Australia’s Wheatbelt. 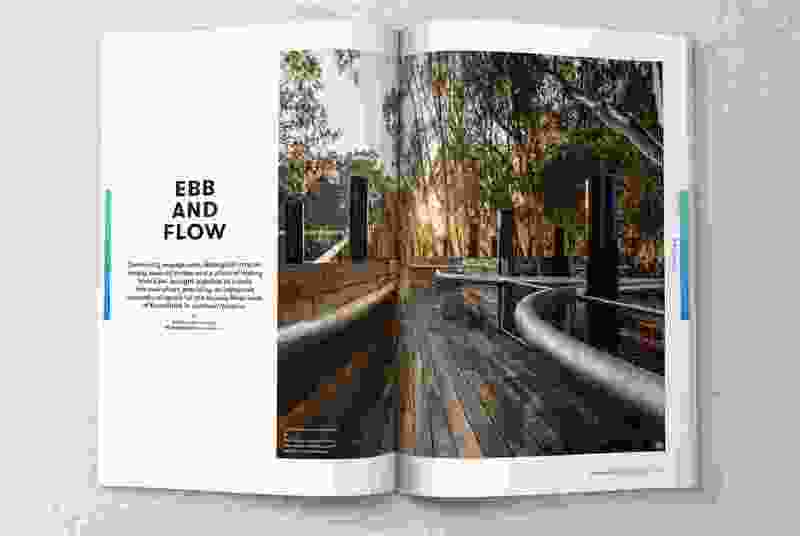 We also feature two design projects, the Gap and Natural Bridge by the Western Australian Department of Parks and Wildlife (p. 48) and Koondrook Wharf by Terroir with Hirst Projects in the Murray River town of Koondrook (p. 40). These interventions have invigorated their respective regional communities through increased tourism and cultural identity. 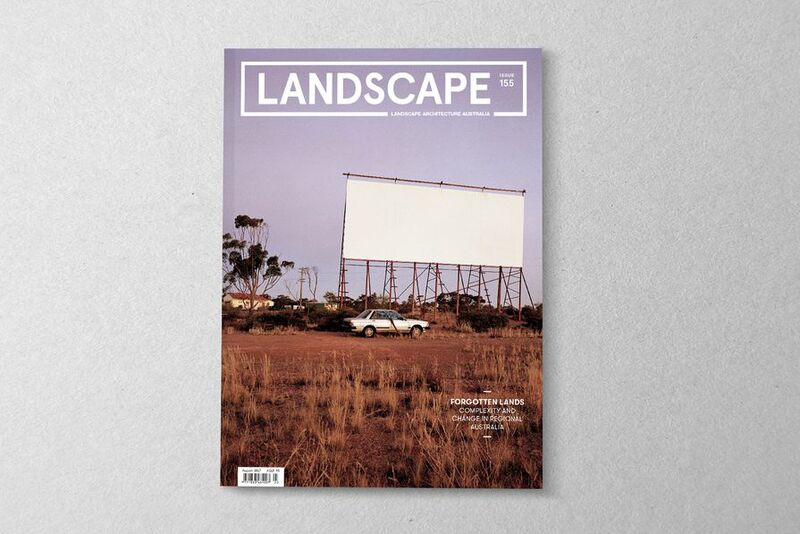 This issue is bursting with essays, project reviews and personal stories that demonstrate the knowledge and sense of ownership held by those who design, care for and work on the land. 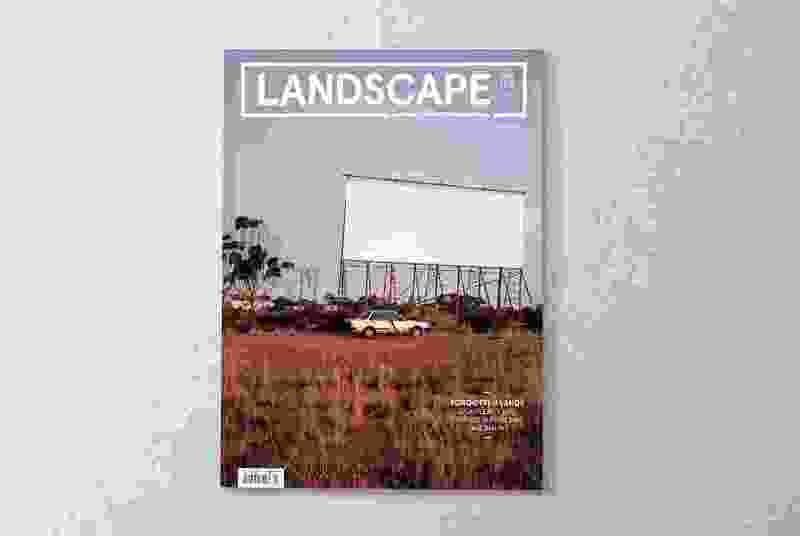 The issue also highlights the immense value of reflecting on the impact of our individual and collective practices on the future of the Australian landscape. Fields of decline. Western Australia’s expansive Wheatbelt region is in decline. Can landscape architecture offer a sustainable future? Article by Karl Kullmann. Plant Selection. More than trees, shrubs and groundcovers: are the descriptors we use to categorize plants adequate? 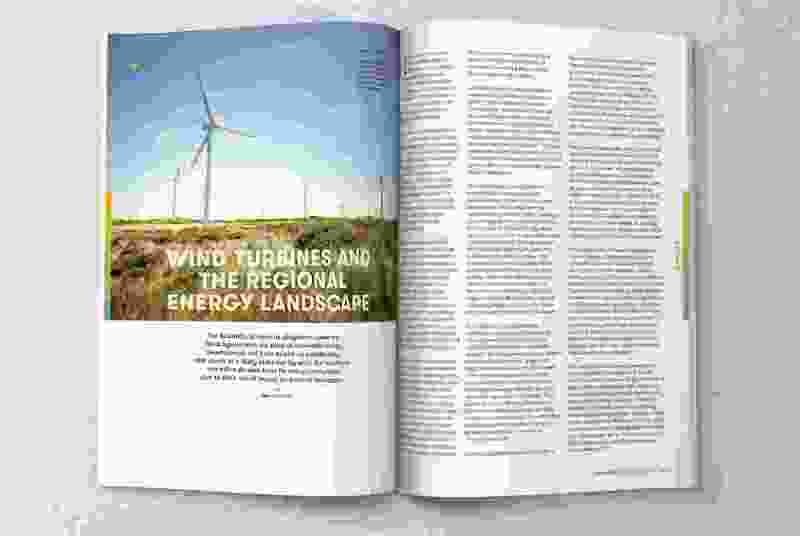 Wind turbines and the regional energy landscape. Renewable energy projects often create tension in regional communities because of their visual impact on pastoral landscapes. Article by David Moir. An ecological approach to grazing. Over four decades grazier David Marsh has shifted from an industrial approach to farming to an ecological one. He shares his story. Article by David Marsh. Design before disaster. 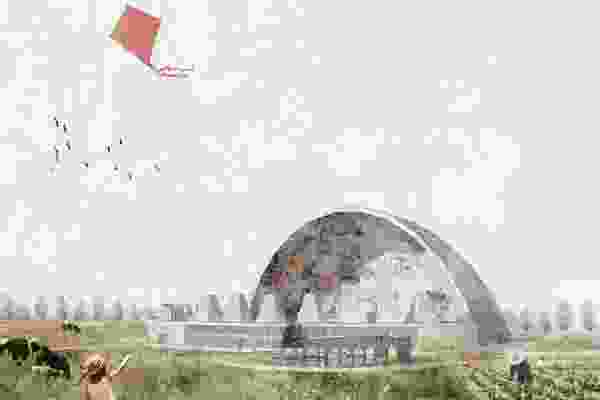 With extreme weather events predicted to increase, how can design create more resilient regional landscapes? Article by Rob Roggema. Ebb and flow. Terroir and Hirst Projects have designed a new wharf for the Victorian town of Koondrook, galvanizing the town’s sense of place. Review by Danielle Jewson. Bridging the gap. A new walkway and cantilevered viewing platform provide universal access to one of Western Australia’s great natural tourist attractions. Interview by Rosie Halsmith. Farming in a small way. The Small Farms Network educates landowners on sustainable land management. Article by Jennie Curtis. Sharing and caring for Ngunawal pathways. On working with the Ngunawal community to strengthen cultural landscapes in the Canberra region. Article by Karen Williams. Post-environmental landscapes. Trying to balance scenic beauty with ecological value has created community tension in the Far North Coast of New South Wales. Article by Mark Perkins. Let’s talk about complexity. 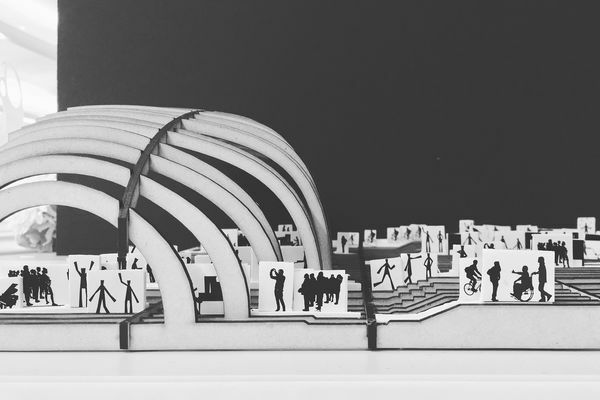 What are the benefits of engaging with complexity in ecological design? Article by Wai Kin Tsui. City limits. This instalment of our Field Trip series reflects on a photographic essay by Dianna Snape that documents vernacular town signs. Essay by Naomi Stead. “On the Frontline: Climate Change and Rural Communities,” Climate Council website, 9 August 2016, climatecouncil.org.au/ruralreport (accessed 5 June 2017). 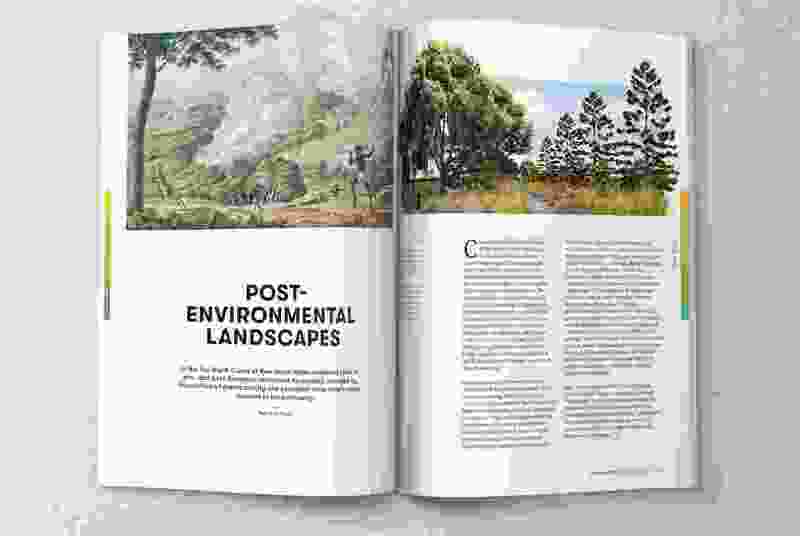 Spread from the August 2017 issue of Landscape Architecture Australia.